The experts in designing, manufacturing, installing and caring for your shade sails. At Shady Places, we pride ourselves on servicing the shade sail needs of businesses, schools, playgrounds, childcare facilities, and a wide range of commercial industries. Welcome to Shady Places, the experts in designing, manufacturing, installing and caring for your shade sails. At Shady Places, we pride ourselves on servicing the shade needs of businesses, schools, playgrounds, childcare facilities, and a wide range of commercial industries. We know reliability is everything, so we’ve worked hard to establish a reputation for providing quality services and products on time and to suit everyone’s budget. Our highly trained and experienced staff are committed to providing the very best shade sails and shade structures for protecting your employees, young charges, and customers from the sun’s harsh and damaging UV rays. Shady Places is a company with many years of experience in designing and installing architectural and commercial Shade Sails to enhance the look of your school/business. We provide a fully integrated design, construction and fitting process, which results in a shade structure that is truly customized to your specific requirements. The business owner Steve Goodwin, has had more than 15 years’ experience in designing, manufacturing and installing the right shade sail or structure design to suit our clients’ needs. 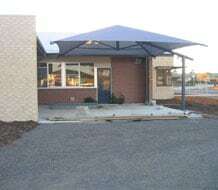 Steve has been supplying and installing shade sails and shade structures for clients in all Melbourne suburban areas, Geelong and Regional Victoria for Schools, Councils and both Commercial and Domestic clients that require design advice, structures that are built to engineers requirements and peace of mind that we are manufacturing a structure built to Australian standards using Australian sourced materials. 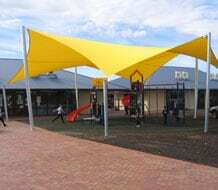 Our shade sails are designed to suit a wide range of areas and needs. 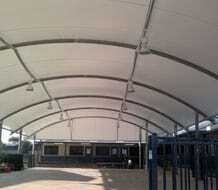 In addition to large-scale commercial installations, shade sails are well suited to domestic sites. Aside from making attractive carports, shade canopies provide excellent protection over the family pool, and are a viable practical alternative to a pergola. So if you’re looking for shade sails, you’ve come to the right place! 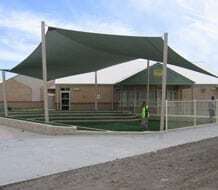 Purchasing the right shade structure or shade sail design for your school, kindergarten, playground area or business can be a difficult decision to make. Designing a shade sail or structure to suit an area that will provide adequate shade, protect students and staff from harmful UV rays, while also creating an area that will enhance the look of your facility, is what we do at Shady Places. Steve can provide our clients with a detailed conceptual drawing, showing the shade sails or structures position in conjunction around other buildings or landscaping. These drawings can also show the shadow of projected shade depending on the time of the day or year. 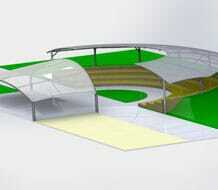 A great way to plan your design and maximise shade coverage. 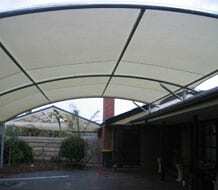 As a professional shade structure business based in Melbourne, we aim to offer all our clients a quality service from the quality of materials used to manufacture our shade sails and structures to our workmanship in creating shade sails and structures that are built strong and safe in accordance with Australian Standards and Engineering requirements. 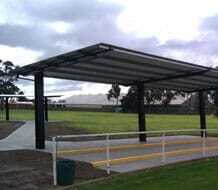 At Shady Places we offer our clients a service of designing, manufacturing and installing shade structures and shade sails in all Melbourne suburbs and Geelong, to cover a variety of areas from playgrounds, outdoor seating areas, swimming pools, sporting spectator areas, amphitheatre stage areas, large assembly areas to car parks or shelters for any purpose. Included in our design range are Shade Sails, Hip Ridge Structures, Commercial Umbrellas, Cantilever Structures and Rolled Structures. Our shade sails and structures can be made using Commercial grade shade cloth, PVC waterproof fabrics or Colour bond hard roof materials to provide protection from the sun or rain. 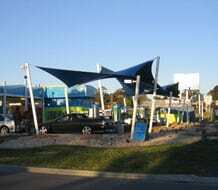 You may find many services for shade sails in Melbourne and Geelong, so what makes Shady Places so unique? Our dedication to supplying a superior product to our clients and offering the best customer service we can. We continually ask our customers what they want and really listen to their needs. We encourage feedback from our clients and strive to expand our knowledge and skills, so that we can be sure to provide only the best products and services to our clients. If our clients are satisfied and happy with their professional experience with us, then we have been successful. 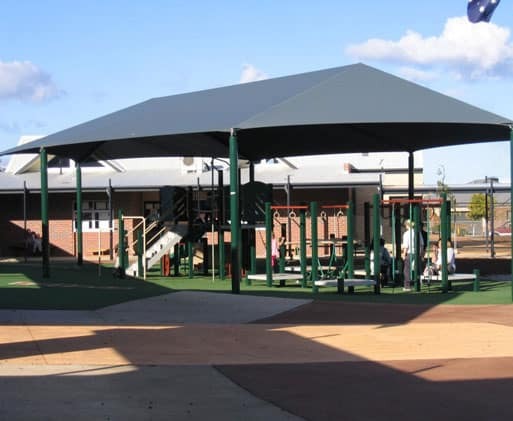 Canopy-style shade structures are ideal for childcare centres and kindergartens as they are designed to span large areas while allowing for adequate clearance around large play equipment. We have always been pleased with the quality of work from “Shady Places”. In particular the materials used and the efficient and prompt manner tasks were completed. Our dealings with Steve (Managing Director) have been business like and cordial. We have engaged “Shady Places” on several occasions and will continue to do so in the future. 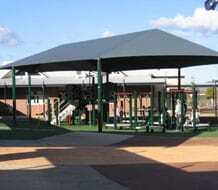 Their service and competitive prices have been excellent for our school community. We would have no hesitation in recommending “Shady Places” for your shade cloth needs. On behalf of Mowbray College I wish to extend our sincere appreciation for the three projects that you and you team at Shady Places have completed for us over the past two years. Your knowledge and suggestions on the types of structures that best suit our needs has been invaluable and your professional approach and rapport with clients easily outstrips that of your main competitors. We appreciate the ongoing relationship we have with you especially in regards to maintenance and the immediate advice on ways of improving our school grounds. Your professional team of workers has always conducted themselves in an appropriate manner in our school yard and I have received numerous positive comments about your work from our community members. All of the above incorporated with your competitive pricing schedule and quotes make it undeniable easy to recommend your company to other schools and organizations. We look forward to continuing our relationship with you and your company as required. I am pleased to provide this testimonial for Shady Places, a business run by Steve Goodwin. Steve has provided excellent service to Baden Powell College on many occasions. The quotes provided have been very competitive and all projects have been completed on a timely manner. Steve is very professional in his business demeanour and very approachable when working in the school environment. We have used the services of Shady Places over the last 2 years. When initially seeking designs and pricing for a significant shade sail project we sought designs and quotes from a number of companies. The brief given to the companies was to provide something that had flair and was competitively priced. From our perspective Shady Places was the only company that fulfilled both components of the brief. We were extremely pleased with the final product and it has been the feature centre piece of our school.